When profiles are enabled in Help Center, users can click any user names to open that user's profile in Help Center. Signed-in agents can further open the user's profile in the Zendesk Support agent interface from the Help Center profile. If you have set up multiple Help Centers for multiple brands, Help Center profiles are unique to each brand. That is, each Help Center profile contains only the user's activity for a specific Help Center and not all of your Help Centers. The user profile is not brand specific, but contains activity for all Help Centers across brands. Click the user's name or avatar in an article, post, comment, or search result in your Help Center. The user's profile opens in Help Center. Click the user's name or avatar in your Help Center, then click the user's name again in the profile or click Open user in Support in the profile. 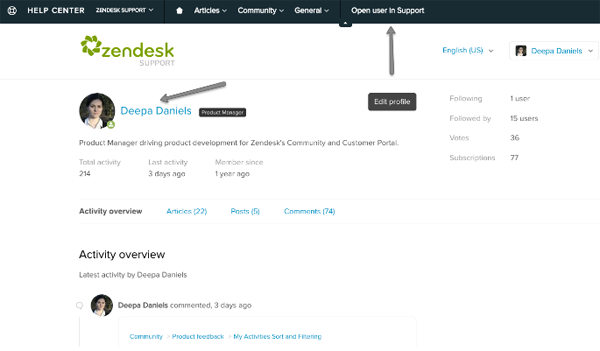 The user's profile opens in the Zendesk Support agent interface. I'm curious to know who are my six followers on Zendesk, and can I access this data in the API or is it easier than that?